February 10, 2015 by beWARM. Doesn’t she have the most beautiful smile? That was the first thing I noticed when I met Miladys last year. She was one of the lovely ladies who attended the restrooms on our eye project in Colombia. When I saw that Miladys’ right eye was in need of a prosthesis, my heart sank. Lawrence, our gifted ocularist, was not able to make the trip in 2014. Throughout last year’s project, I marveled at how she glowed each time she smiled. She and the other ladies who so cheerfully greeted us each day were tireless as they restocked paper products and kept all surfaces sparkling clean. I vowed to pray that 1) Miladys would be back to help us in 2015, and 2) that Lawrence would be on our team, and would be able to fit her with a prosthesis. God heard my prayers – and He answered them. Midalys received her new eye on the first day of the project. We both cried tears of joy. What I didn’t know was that her eye had been injured due to an accident when she was 2 years old. Had she lived in the states, she would have gotten a prothesis long ago. Although the results of having a prosthesis are cosmetic, surely the internal effects are monumental. And for some people in Third World countries, missing an eye means not being able to get a job, or find a spouse. 26 people in Cienaga, Colombia were fit with prostheses during our 2 week MMI project. All were overjoyed – and immensely grateful. The prostheses were but one small part of the work done by our Dream Team of 70 people. Over 5000 of pairs of glasses were fitted, and over 200 surgeries were performed. Patients blind from cataracts could see once again. Children and adults with strabismus had their crossed eyes straightened. Diabetic patients and those with glaucoma received laser treatments. Smiles, hugs, and prayers were in abundance. Our team members were steadfast and enthusiastic, pitching in wherever needed, learning new jobs when necessary. Serving alongside such devoted and inspiring people always gives me new vision and inspiration. This quote is on the front of the journal I used on our very first eye project in 1995. Twenty years later, it still rings true. Surrounding the miracles and bountiful blessings we experience during each and every mission project, one thing is true above all. Seeing the faithful presence of God is what makes us all believe – in His goodness, His mercy, and His grace. How blessed we are are that God’s desire is for us to have perfect vision – and that He continues to fine tune our ability to see as we journey through life. 20/20 never looked so good…. So happy the project was full of good things. I missed being with you all! on February 10, 2015 at 2:21 pm | Reply beWARM. What a joy to be with such an amazing team! And a joy to have you and Doug on our team! on February 10, 2015 at 2:22 pm | Reply beWARM. 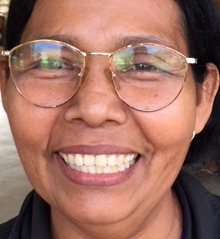 Thank you, Shelia….and I know you have had similar experiences….. Praying for your Bolivia team! on February 10, 2015 at 2:23 pm | Reply beWARM. on February 10, 2015 at 2:25 pm | Reply beWARM. on February 10, 2015 at 2:28 pm | Reply beWARM. Thanks to you and Louie for your prayers during our project, Frannie! They were deeply felt….and they helped to make all of the details come together without any problems! Amen and Amen! What a joy to see Miladys every day and the gals who so willing served alongside us. Watching God in a multitude of ways with this delightful team of 180 who served with harmony, love and faithfulness! A picture of our eternal community. on February 11, 2015 at 2:35 pm | Reply beWARM. Eternal community…what a lovely way to describe it! Thank you, Linda! It is always wonderful to work with you…. on February 16, 2015 at 6:43 am | Reply beWARM. Our team was amazing! Thanks for reading, Conrad….